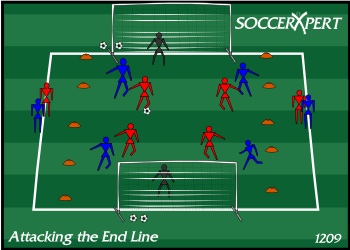 Using half of a field, move the goal to the midfield line facing the goal on the end line. Using 4-5 cones on each side, create a 10-yard wide channel along each touchline. Two teams of 4 play in the middle. Each team has one player in the channel and a goalkeeper in both nets. One team starts with the ball and the remaining balls behind the goal. Instruct the players to play 4v4 in the middle area and 1v1 on the flanks in either channel. The ball must be served from a channel to score a goal. When the ball is in the channel, the channel players should play 1v1 until one of the player’s breaks into the offensive side of the channel. At this point, the defender should allow the cross. The four players in the middle make near post, far post, trail, and supporting runs. Proper service of crosses from flanks. When to serve on the ground, when to knock back, and when to drive hard. Make sure attackers are making proper runs. Use wall passes, takeovers or overlaps.